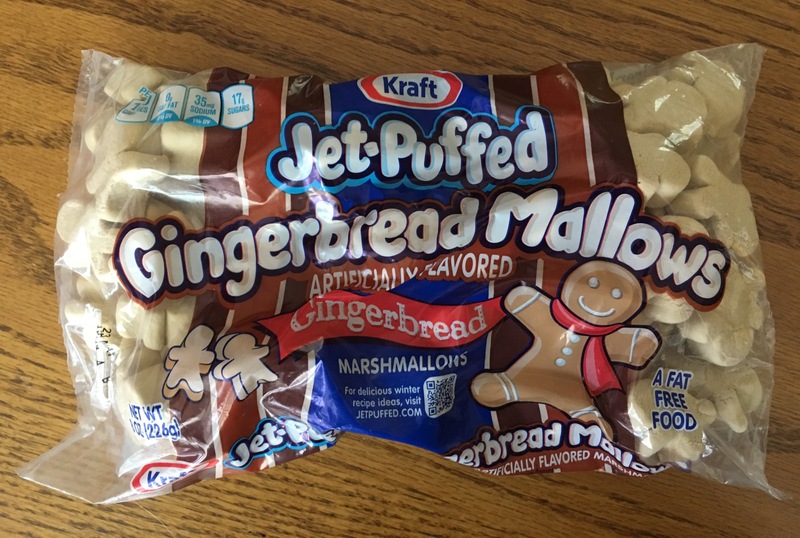 The only marshmallows in my house. Ick. This book is a bit of a hybrid. It’s a memoir, telling stories about Mischel’s research over several decades, his own struggles with temptations (such as nicotine), and vignettes of success stories and individuals involved in the research described in the book. It summarizes psychological science research from various fields relating to self-control and success. While there are some tips provided that can be used by people hoping to improve their own self-regulation, and/or develop these skills in their children, I’ll note that it’s not really a self-help book. Mischel takes particular care to highlight the fact that self-regulation skills exist, that there are techniques can help with shifting from hot to cool thinking, and that these techniques can be learned. He also says that “The Marshmallow Test was not designed as a ‘test’.”, although early indication of self-regulatory abilities is remarkably predictive and stable in most individuals. 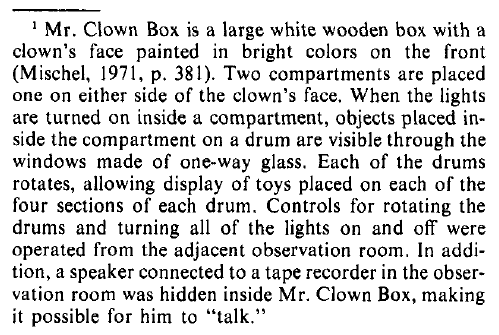 Mischel and Patterson found that children could develop and use “if–then” plans to avoid the normal hot response and substitute a cooler one, as in an example from the book: “When Mr. Clown Box says to look at him and play with him then you can just not look at him and say, ‘I’m not going to look at Mr. Clown Box.’. This type of method can work for people beyond pre-schoolers who want to avoid temptations. (E.g., “If I buy a coffee by the donut display, I will walk away after filling my mug, and not look at the donuts inside the display case.”*) Ideally, if practised over time, these plans can help a person build habits, and the cool responses become automatic, less effortful. 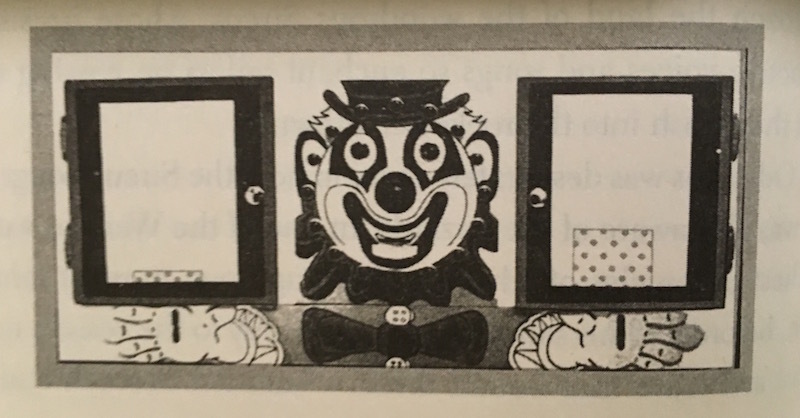 Nightmare-fodder clown aside, I think this set of experiments might be particularly relevant today, with all the digital distractions that we face from our laptops, cell phones, and other devices. Many of the suggestions that have been made regarding reducing distractions falls into the “if-then” plan model – e.g., if you must have your cell phone with you in class, turn off notifications during class time. I do suspect that the allure (or addictive nature?) of these distractions goes beyond that of a toy-filled wooden box, though. The second part of the book deals with issues relating to delayed gratification and self-regulation in adult life. These chapters discus research findings from various aspects of psychology relating to success: the importance of executive function (cognitive skills and neural mechanisms involved in deliberate control of thoughts, impulses, actions, and emotions; well-developed EF allows good planning, problem-solving, and coping with unexpected situations), growth mindset vs. fixed mindset (the belief that we can grow and improve vs. possessing static skills/abilities), mirror neurons (which may contribute to empathy), and optimism. The dynamic nature of willpower is explored – it is possible for an individual to be highly self-disciplined in some areas, and woefully undisciplined in others. Mischel also talks about the difficulty we have envisioning our future selves (often shortchanging ourselves in things like poor retirement planning), psychological distance (what feels more distant is typically more abstract), and self-distancing as a way to cope with painful situations. A lot of this overlaps with other books I’ve read over the past few years (Dweck‘s “Mindset“, Kahneman‘s “Thinking Fast and Slow“, Tavris & Aronson‘s “Mistakes Were Made (But Not by Me)“, etc. ), but Mischel’s book was actually published before many of these other books, and I appreciated his approach to these topics. In the last part of the book, Mischel highlights the success of KIPP schools, and the need for public policies to reflect evidence about developing self-control at an early age. He also summarizes some key strategies that could be applied by those striving to improve their own self-regulation skills, or foster such skills in their children. I enjoyed this book, which I found an easy read. It has given me food for thought with respect to trying to support students in developing/strengthening self-regulation skills (e.g., effective studying, avoiding digital distractions), but it also made me think that it would be much more effective to address self-control skills when children are young. As someone who is trying to improve her own self-control** and make better decisions, the book has provided some valuable findings from research that I’ll try to act on, too. I recommend this book if you’re interested in the psychology of self-control and want to learn more about the science behind it. Mischel, W. (2014). 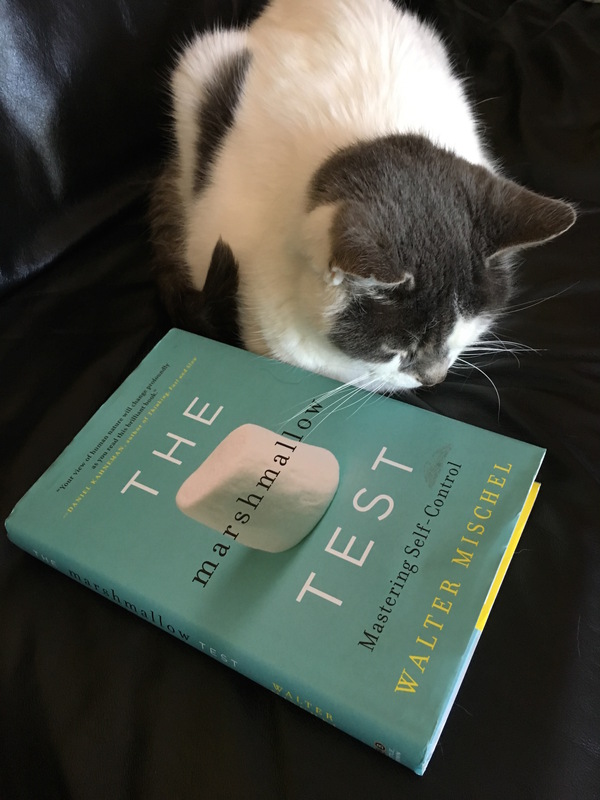 The marshmallow test: Mastering self-control. Little, Brown and Company. Patterson, C. J., & Mischel, W. (1975). Plans to resist distraction. Developmental Psychology, 11(3), 369. * The coffee station in the main campus cafeteria is right next to the donut display. ** I may have eaten at least one donut while writing this post.